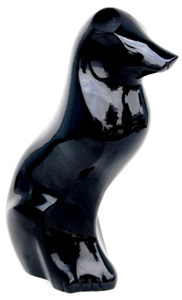 This figurine dog urn in black gloss finish is a truly unique and modern urn for your dog's ashes or keepsake urn for a token portion of cremation ashes. High quality solid brass urn with black gloss finish. Hand casted and intricately hand designed by skilled artisans. Your dog's ashes can be safely placed in the urn via a threaded secure lid at the bottom. Can be used as an urn for small to medium dogs or as a keepsake urn for larger dogs, storing a token amount of ashes. Capacity: 31 cubic inches - suitable for ashes remains of a pet body weight approx 31 lbs or 13kg (suitable for small/medium dogs or as a keepsake for larger dogs).